An offering from the Pacific Coast that features squid stuffed with more squid, shrimp meat, raisins and pine nuts. Add clams and crab simmer them all in a white wine and tomato sauce. This is a recipe for a very special supper, and should be attempted when you have the time to devote to a truly spectacular dish. It presents itself extremely well and tastes like you spent the time pleasing your guests. 1. Boil four calamari and the tentacles of the other 12 calamari for 15-20 minutes, or until tender. 2. Meanwhile, in a separate pan, saute onion in oil until browned. 3. Chop the cooked calamari and add to the onion mixture. 4. Add shrimp, lobster, wine, pepper flackes, pine nuts, raisins and water. 5. Bring to a boil and then reduce heat and simmer for 10 minutes, stirring constantly. thoroughly. Set aside and let cool. remaining uncooked calamari. Secure with toothpicks. the cooked crab in the shell for the last 5 minutes or until heated through. 9. 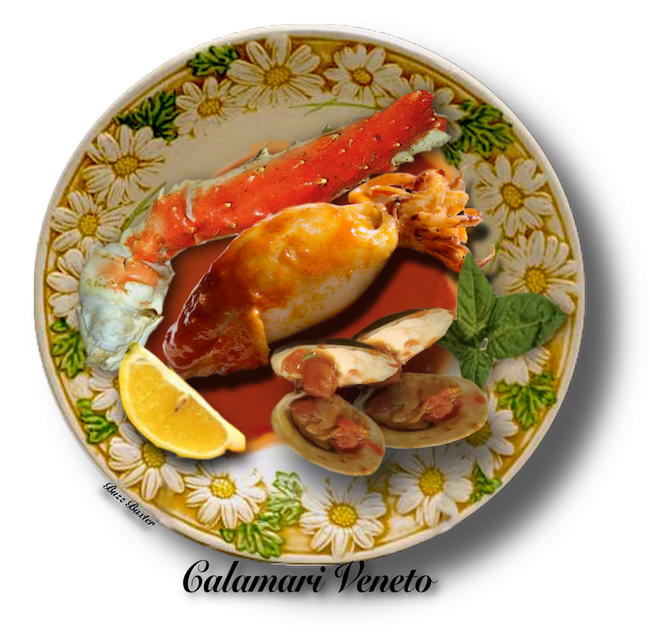 Plate with one stuffed calamari, 2 clams, and a generous portion of crab. Serve. sugar,  balsamic vinegar, salt and pepper.